"Well, We Can Think About It!" Title: "Well, We Can Think About It!" "The United Repeal Council lobbied at both the Republican and Democratic national conventions in 1932 to integrate repeal into their respective presidential election campaigns. Ultimately, the Republicans continued to defend Prohibition. The Women's Organization for National Prohibition Reform (WONPR), which initially began as a nonpartisan organization, joined with the Democratic campaign and supported Franklin Roosevelt.... 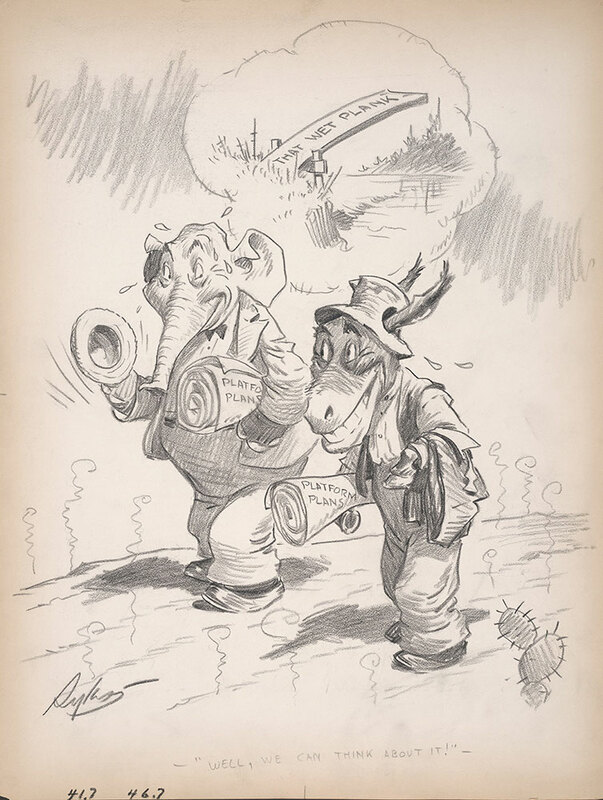 In 1932 the Democratic Party's platform included a plank for the repeal of Prohibition, and Democratic candidate Franklin D. Roosevelt ran for president of the United States promising repeal of federal Prohibition laws." "Repeal of Prohibition in the United States." Wikipedia. Wikimedia Foundation. Web. 20 Nov. 2015. https://en.wikipedia.org/wiki/Repeal_of_Prohibition_in_the_United_States. Created for Evening Public Ledger, date unknown.